Flowers from Clary Sage plant, Salvia sclarea, are the source of an essential oil used exclusively in perfume as both a fixative and perfume. The leaf, strangely, has no scent. Used medicinally for eye complaints. 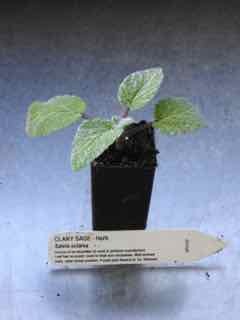 Clary Sage plant is native to southern Europe and Syria and prefers light, dry, well drained soils, in an open sunny position. Purple-pink flowers in summer. Drought and frost resistant. Biennial plant growing to 1m x 1m. Be the first to review “Sage, Clary plant” Click here to cancel reply.